An all-new pool and deck on Orange Street. Swimming up high with a mountain view. Something for pro training in Wynberg. And seven others, including waterslides with pools for the whole family. These are the private pools that are open to the public this summer. Enjoy. Open just in time for summer, there's a new pool as well as a cocktail bar on this famous Orange Street hotel's newly done Murano Deck. And, psst ... it's open to the public. Come check out the new-look 15 on Orange Hotel, Autograph Collection. 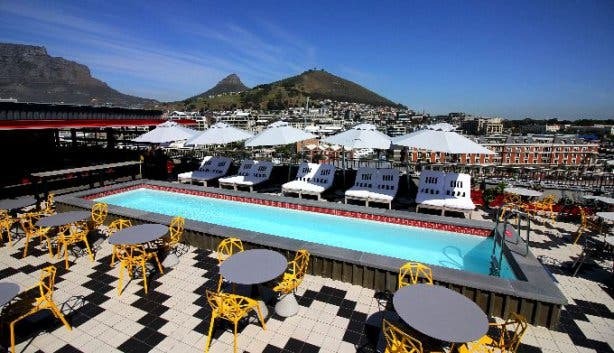 Summer in Cape Town doesn't get much better than the rooftop pool and bar at Cloud 9 on Kloof Nek Road. Every day of the week, the rooftop bar opens at 1pm. 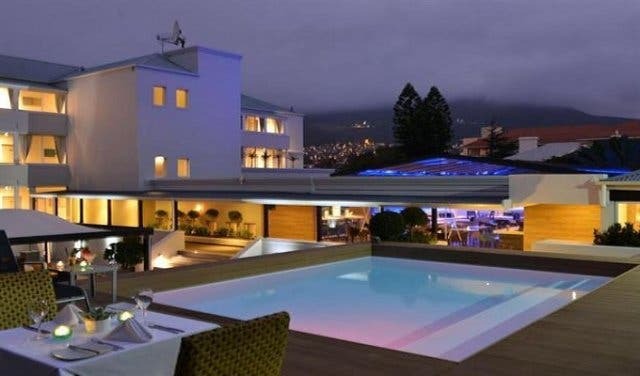 And, for R150pp you can dive into this pool with an awesome view until late at night. 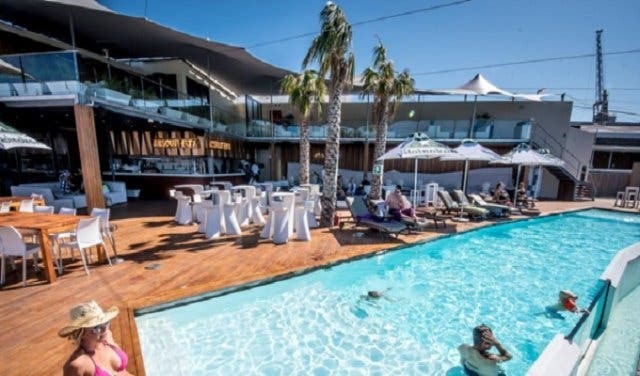 Check out the Cloud 9 Rooftop Bar and Pool. For R150, you can spend the day at the hotel’s pool deck. Relax on a luxurious sunbed and cool off with regular dips in the pool. 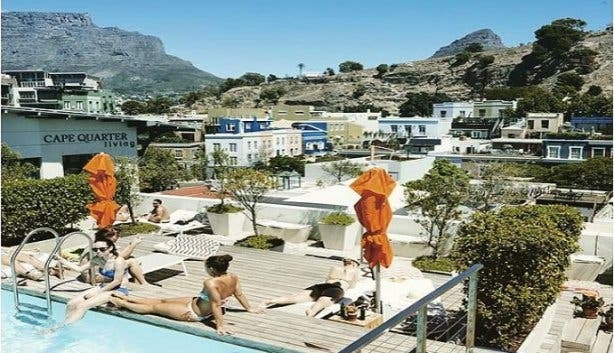 Besides a panoramic view of Table Mountain, you can indulge in one of the many cocktails on offer and feast on fresh fish or a delicious grilled steak. This is a great place to just relax and enjoy the sun and keep cool. 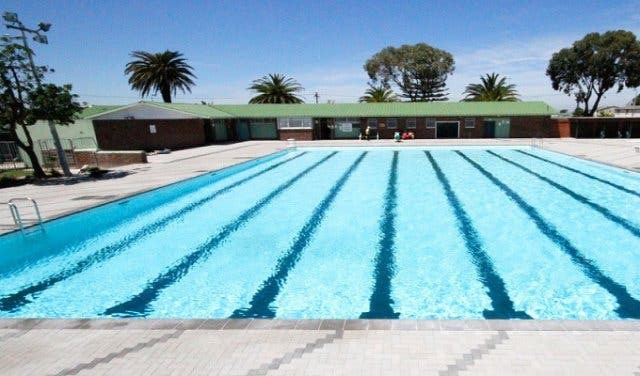 If you're an athlete or aspiring to be one, here's an immaculate pool for serious training. 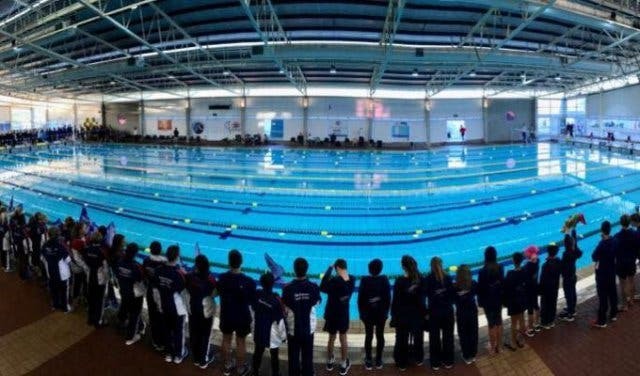 The Wynberg Military Aquatic Centre is run by a school called Swimlab, which trains athletes from all over Cape Town and surrounds. 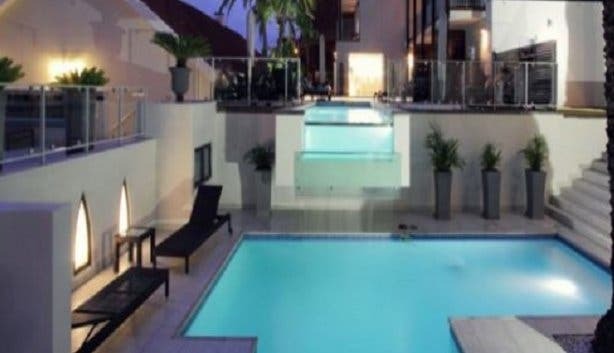 Using the pool doesn't require a membership. 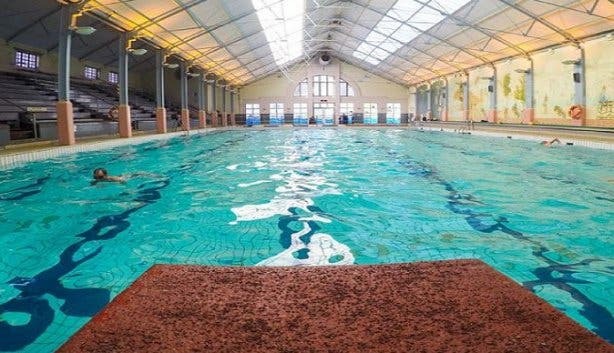 The covered 25-metre pool has four lanes and the water is maintained at around 26 degrees Celsius. There are basic change room and shower facilities. It's a training facility more than a family recreation spot. 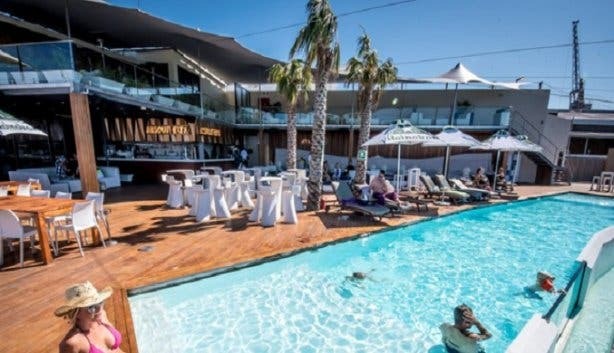 A swimming pool with a bar overlooking the sea and a small beach: you must be at Shimmy Beach Club. The artificial beach is a wonderful spot to relax during summer. Extra luxuries (you can hire out their loungers and cabanas) ensure a comfortable laid-back day punctuated by refreshing swims in the pool. And, there are regular parties where you can enjoy performances from local artists such as Goldfish. 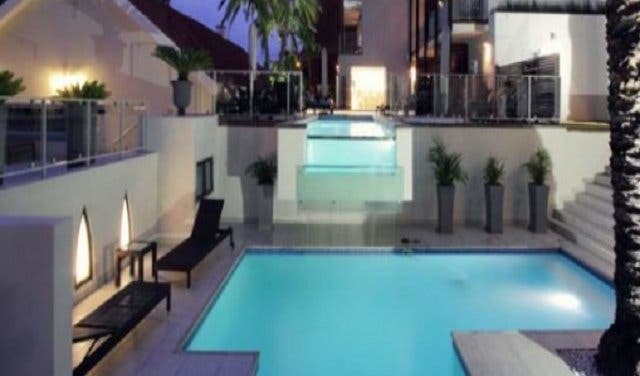 This is an ideal location for family and cocktail parties and, of course, a swim in the pool. Crazy about slides? Then Muizenberg Water Slides also known as “the supertubes” is for you. 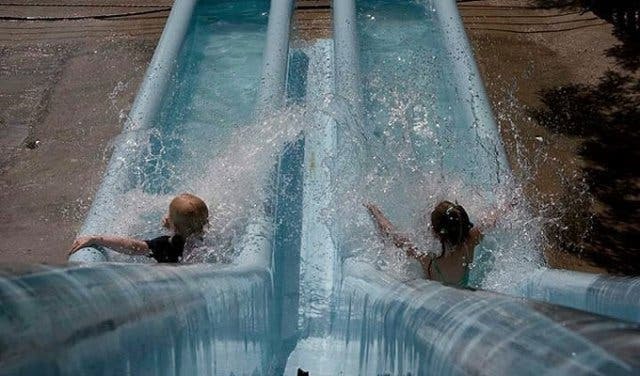 There are three different slides: the big twisty/turny slide with lots of bends; the fast slide providing an adrenaline-rush and the children’s slide for the little ones; the slides are suitable for children aged 3+. Lifeguards are on duty for everyone’s safety and the water is solar-heated meaning you can slip and slide for longer without getting cold. There’s a picnic spot with shaded seating and tables so you can bring along snacks and make a day of it. Alternatively, there’s a small shop on the premises selling snacks and cooldrinks. Hours: Monday–Friday, 1:30pm–5:30pm; Saturday and Sunday, school and public holidays, 9:30am–5:30pm. For the months of November to end February, the water slides are open on a Friday evening from 6pm to 9pm. 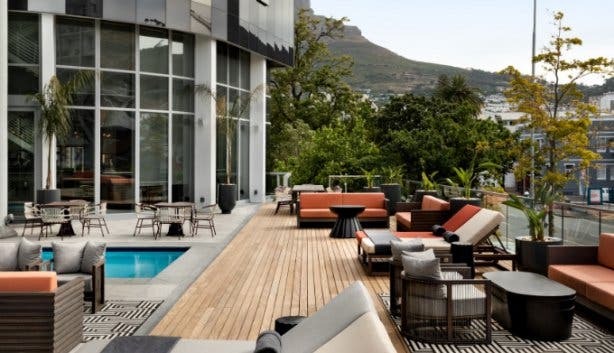 A chic boutique hotel located in Sea Point with two sparkling swimming pools – one of 11 metres and one of 7 metres – offers a relaxed atmosphere for soaking up the sun followed by a refreshing swim. There are 42 sun loungers plus a bar (take a look at the intriguing cocktail menu) and restaurant, so get there early as space is limited. Hours: Monday–Sunday, 8am-9pm all year round. 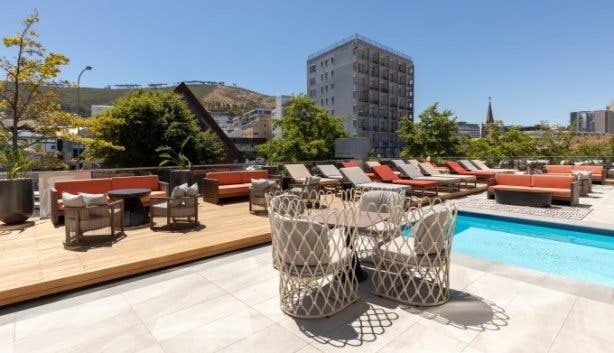 Situated in the trendy Silo District, you’ll be rewarded with stunning views of the V&A Waterfront and Table Mountain while lounging around the swimming pool at the Radisson Red Hotel. There are sun beds and a bar for food and drinks. If you linger long enough you can watch the sunset while sipping on a cocktail or smoothie. An ideal day, indeed. 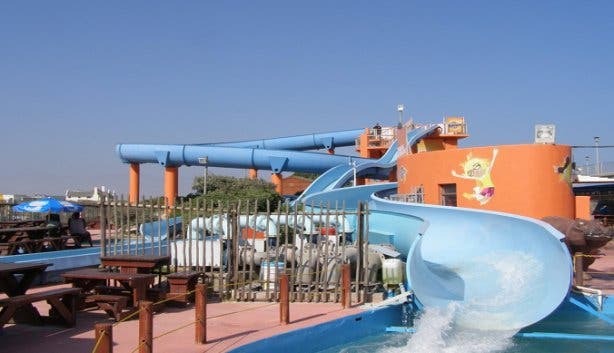 This water park offers great fun and entertainment for the family. The park is tucked away in a grassy, forested nook protected from the sometimes ‘unfriendly southeaster’. The venue boasts five slides of varying size and thrill levels, an extensive land play area with a jungle gym and mini zip line. There’s a cafe on the premises offering simple but tasty food and refreshments. 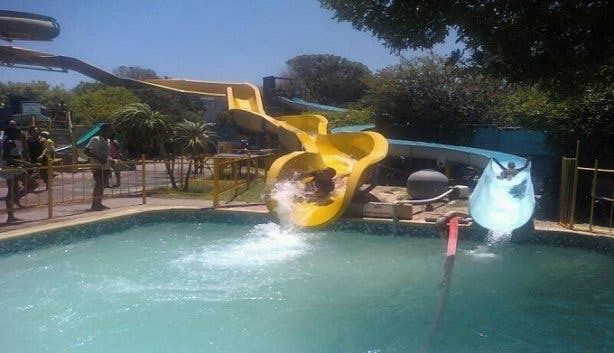 For a fabulous day of wholesome family fun, visit Waterworld Strand. Hours: Tuesday–Friday, 1pm–6pm; Saturday and Sunday, 9am–6pm, school holidays and public holidays, daily 9am–6pm. Closed on Christmas Day, 25 December. 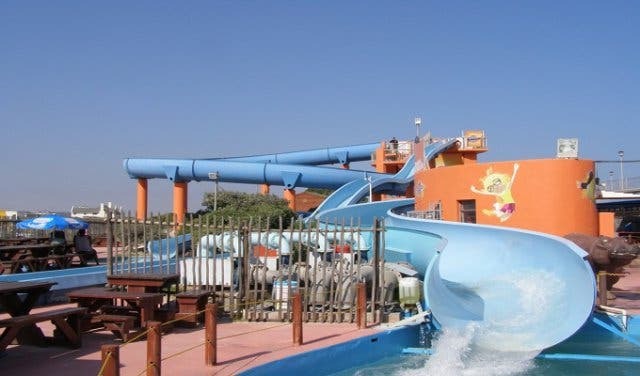 Make your way to the Milnerton Water Park for a perfect family day out with loads of entertainment for everyone. 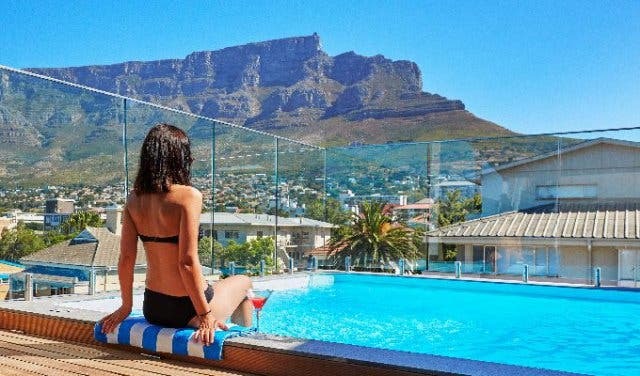 There are several swimming pools, great waterslides, a mini-golf course, trampoline and many other fantastic facilities, including braai facilities – all the elements for a happy family day out. Hours: Monday to Sunday, 8am–5pm. 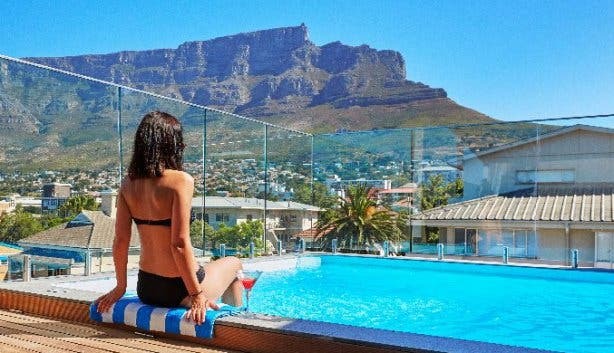 PLUS: See all the Cape Town public pools open this summer. 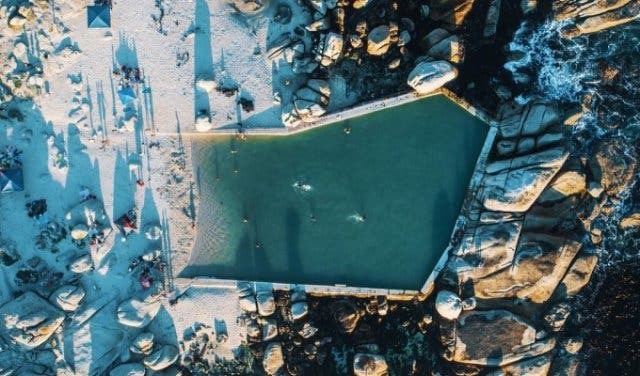 Also, discover (and swim for free at) these special and hidden tidal pools in Cape Town. 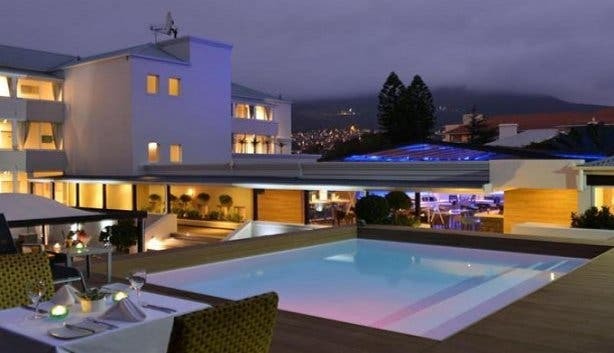 A swimming pool on a rooftop? Or just want to enjoy the views? 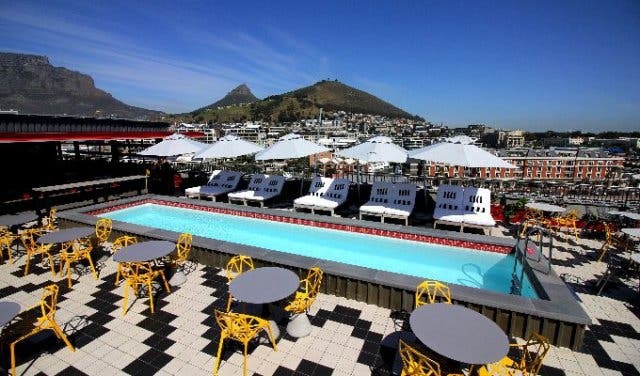 See our feature on rooftop bars in Cape Town. Here are some ideas for other things to do with kids and then there are free and cheap things to do.